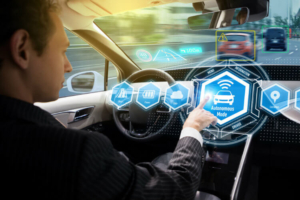 One of the reasons that Arizona has become a pioneer in this area is that it has kept regulations surrounding the Automated Driving Systems (ADS) industry at a minimum and, in so doing, has attracted many in the ADS industry to conduct testing in Arizona. As just one example, Google’s Waymo launched an early rider program in parts of the Phoenix metropolitan area where riders can use self-driving cars to go places and then share their thoughts and experiences. Autonomous vehicles operating on public roads are subject to both federal and state jurisdiction. States are beginning to draft legislation to safely deploy emerging Automated Driving Systems. So far, 29 states have enacted legislation related to autonomous vehicles. He updated that directive with Executive Order 2018-04 in March 2018, which requires all automated driving systems to be in compliance with all federal and state safety standards. In October 2018, the Governor signed Executive Order 2018-09, establishing an Institute of Automated Mobility (IAM). The IAM will bring together partners from the private and public sectors to test automated vehicle technology and develop the policies and guidelines needed to fully implement this advancing technology. 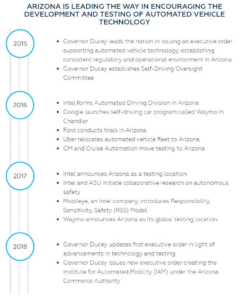 The Governor’s office has also established a Self-Driving Vehicle Oversight Committee, made up of transportation, public safety, and policy experts, to advise the Arizona Department of Transportation and the Arizona Department of Public Safety on how best to advance the testing and operation of self-driving vehicles on public roads. Some of the legal challenges surrounding ADS safety were brought into the national spotlight after a fatal accident involving an Uber self-driving car in Arizona in March of this year. Today, traffic laws are designed with the assumption that a person is driving. Tomorrow, that may not be the case. Each state’s and our nation’s future laws will have to address the challenges that will come with fully automated vehicles. For example, should an officer stop a fully automated vehicle or should there be technology that identifies violations? Whether or not that becomes a reality, these innovative automated technologies will come with a vast array of new legal, legislative, and regulatory challenges. Tiffany & Bosco represents over 60 motor vehicle and RV dealerships in Arizona. Our automotive law practice group is nationally recognized for their innovative and comprehensive delivery of legal services. To speak to an attorney about automotive law, call 602-255-6000. For more insights from the Tiffany & Bosco legal team, visit our Insights page.